Got a little sucked into the YouTube wormhole today. Started out looking for I don't know what and wound up digging into famous basketball players games. Most NBA fans remember cornerstone moments by the likes of Micheal Jordan, Larry Bird and Magic Johnson. 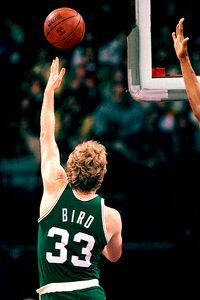 But does anyone remember the "Left Handed Game" as orchestrated by Larry Bird?. I certainly had never heard of it. After some digging around I found out that Larry Legend did this regularly on long west coast trips during their dominate years around the 1986 (50-1 at home, run) season. They say he was bored. I didn't believe it till I saw it. But HERE it is. 22 of his 47 points left handed. He made the shot at the end of regulation to send it to overtime and then preceded to make the game winning shot. Bird in his prime, not to be missed.